Aurora borealis crystal and glass beads make up these dangles earrings on sterling silver kidney style wire earrings. The larger beads are fire polished faceted Czech clear glass beads. The smaller beads are Swarovski crystal bicones. 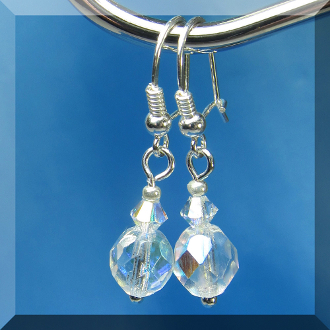 The sterling silver kidney earring wires have coils and loops to hold the dangles. • Swarovski crystal bicone beads, 4 mm. Origin: Austria. • Czech fire polished faceted glass round beads, 8 mm. Origin: Czech Republic. • Japanese silver glass Toho beads, 8/0. • Sterling silver kidney style earring wires. • Silver plated base metal head pins. Origin: U.S.A.